A medical ID allows you to communicate your choice when you cannot speak for yourself. A DNR or Do Not Resuscitate request is usually made by the patient or health care power of attorney and allows the medical teams taking care of them to respect the patient’s wishes. In the U.S., CPR and advanced cardiac life support (ACLS) will not be performed if a valid written "DNR" order is present. 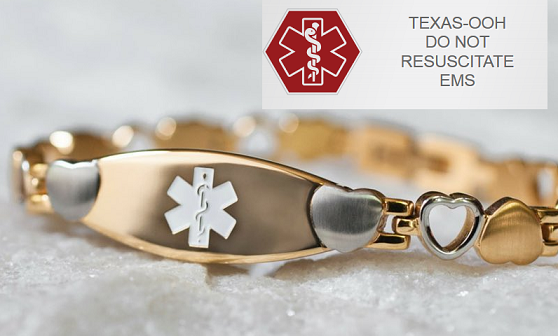 Although state laws vary, it is typical for emergency medical services personnel who are presented with a valid DNR form, signed by your doctor, or who identify a standard DNR bracelet on you, to comply with the DNR order. Prevent over treatment of elderly/disabled Medicare/Medicaid patients for the profit motive. Save money for Medicare and the private insurers in the form of the reduction of end-of-life costs for Medicare and the private insurers when elderly Medicare/Medicaid patients would ELECT/CHOOSE to refuse expensive ICU/CCU life-extending or life-saving treatments in the hospital in order to shorten their suffering unto a certain death. Wearing a DNR bracelet or necklace has become standard way for people to communicate their choice of a natural death over life extension.